You are currently browsing the tag archive for the ‘Alberta’ tag. Dorothy Badry was honoured by the Premier’s Council on the Status of Persons with Disabilities for Alberta on December 2nd. Dorothy has been a long-time advocate, researcher and educator on the impact of FASD (and a dedicated member of the Prevention Network Action Team). Her work has contributed to FASD being recognized as a disability. For families and individuals affected by FASD, that recognition has made a huge difference. In a University of Calgary article written about her, she describes FASD as an health “outcome” – a key shift from early stigmatizing assessments. This allows for a relational approach that includes women, children, families, and communities and for inclusive and multi-level prevention/intervention strategies. An original member of the Canada FASD Research Network, we have benefited from Dorothy’s active participation and counsel. She has been featured in some of our previous blogs for her work at with University of Calgary, Alberta province, and several FASD-related programs. We are happy to feature her once again for this well-deserved honour. Congratulations, Dorothy Badry. The Alberta FASD Learning Series helps individuals with FASD and their caregivers to learn more about FASD and how to support a person with FASD. The webcast and videoconference educational sessions cover a broad range of topics that target both urban and rural audiences. On January 21, 2015 (9-11am), the topic in the series will be The Prevention Conversation Project. The aim of this project is to support open and non-judgemental conversations with women and their support systems about alcohol and pregnancy. For registration information and more information about the learning series, visit the Alberta FASD website here. 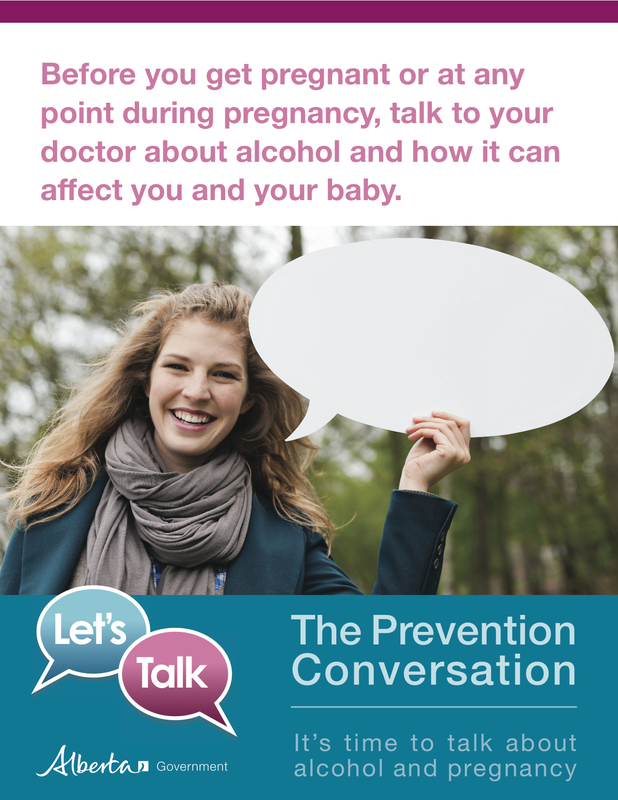 Learn more about The Prevention Conversation on the Edmonton and area Fetal Alcohol Network Society website here. Earlier this year, Sherri Di Lallo wrote an article for the journal Nursing for Women’s Health called “Prenatal Care Through the Eyes of Canadian Aboriginal Women” (Vol 18, Issue 1, pp. 38-46). The article provides an overview of the Aboriginal Prenatal Wellness Program (APWP) in central Alberta, Canada. The four Maskwacis First Nations of Hobbema border Wetaskiwin and Ponoka Counties in Central Alberta and have a total population of 13,784 people. The Aboriginal Prenatal Wellness Program is a culturally safe program that provides client-centered prenatal care that is designed to empower women, families and communities. The program was created in 2005 to serve Aboriginal women who weren’t accessing the traditional system for prenatal care. Between 2002 and 2007, 16.5 percent of all women in Central Alberta who delivered at Wetaskiwin Hospital and Care Centre had received little or no prenatal care prior to their delivery. Of those, 82 percent were from the Maskwacis area. The article discusses aspects of providing culturally safe care, including the importance of assessing cultural biases, understanding the roots of health disparities in Aboriginal communities, and understanding cultural history and current practices. Central to cultural safety is self-reflection and building trustful and respectful relationships. The article provides a summary of an evaluation of the program. Overall, between November 2005 and February 2009, 281 women participated in the program and the percentage of women having limited or no prenatal care dropped. In terms of substance use, forty-four percent of women stated that they quit drinking and using drugs once they found out they were pregnant while 39 percent decreased their smoking and 16 percent quit smoking. The Government of Alberta is hosting the 2014 FASD Conference on October 20-21, 2014 in Edmonton, Alberta, Canada. The multidisciplinary conference focuses on Fetal Alcohol Spectrum Disorder and its impact on individuals, families, communities and society at large. The conference will feature keynote speakers, Hayley Wickenheiser, Michael Kendrick, Peter Choate and Drew Dudley, and over 30 breakout sessions discussing the latest practices in FASD prevention, assessment and support. The primary aim of the program is to prevent future alcohol and drug exposed pregnancies by encouraging the use of effective contraceptive use, by helping women abstain from or decrease their use of alcohol and drugs and by addressing the range of factors that contribute to women’s substance use, including poverty, isolation, and lack of parenting support. The program uses a home visiting/case management approach and is based on principles of harm reduction. The model has been replicated and evaluated across North America and has been found to be effective in a number of ways. A recent study conducted an economic evaluation of the PCAP program in Alberta. Between 2008 and 2011, 366 women participated in 25 P-CAP programs across the province. The evaluation estimated that the program prevented approximately 31 (range 20–43) cases of FASD among the 366 clients in a 3-year period which resulted in a cost-benefit of approximately $22 million. Rasmussen, C., Kully-Martens, K., Denys, K., et al. (2012). The effectiveness of a community-based intervention program for women at-risk for giving birth to a child with fetal alcohol spectrum disorder (FASD). Community Mental Health Journal, 48, 12–21. Thanh, N.X., Jonsson, E., Moffat, J., Dennett, L., Chuck, A.W., and Birchard, S. (2014). An Economic Evaluation of the Parent-Child Assistance Program for Preventing Fetal Alcohol Spectrum Disorder in Alberta, Canada. Administration and Policy in Mental Health and Mental Health Services Research. Yesterday, the Alberta government announced that liquor stores, restaurants and bars are required to display signs about FASD prevention to help raise awareness of FASD. While increasing awareness about FASD and the harms of alcohol use during pregnancy is very important, it’s very interesting that this announcement (as well as other awareness initiatives) rarely discuss whether FASD signage is helpful or effective. Several jurisdictions, including the United States, France, Russia, South Africa, and the Yukon and Northwest Territories in Canada, have regulations requiring warning labels related to drinking during pregnancy and/or other risks. While alcohol warning labels are popular with the public, their effectiveness for changing drinking behavior is limited. Available research suggests that for maximum effect, alcohol warning labels should speak clearly about the consequences of alcohol consumption and should also be coordinated and integrated with other, broader social messaging campaigns. Use of alcohol warning labels related to alcohol and pregnancy must be carefully considered; their messaging has the most influence on low-risk drinkers, and to date they have not been shown to change the drinking behavior of those who drink heavily or binge during pregnancy. However, alcohol warning labels have been shown to stimulate conversations about alcohol consumption and may play a role in shifting social norms to reduce risks. There are so many types of signange these days – from posters to videos to coasters to pregnancy test dispensers – that it’s hard to evaluate each approach effectively. But it does seem clear that these types of efforts may increase knowledge about the risks of drinking during pregnancy but have little impact on women’s behaviours. FASD is arguably NOT 100% preventable – addiction is common in our society, alcohol use often happens before a woman recognizes that she is pregnant, and is linked to issues such as poverty and gender-based violence. But, more importantly, fear of stigma and judgement is a major reason for many pregnant women to avoid seeking help if they are having a difficult time stopping drinking. For women who are at the highest risk of having a child with FASD (and who research shows are least likely to be influenced by awareness campaigns), bystander interventions where people step up and say ‘stop drinking’ will likely make things worse. See the media release from the Alberta Gaming and Liquor Commission here. For helpful information about alcohol and pregnancy, including FASD prevention, see the Alberta government’s Healthy Pregnancies website here.